You can see from the typing that this is an old recipe. I used to make it back in the 70s and 80s and serve it as an entree with thin slices of toast. It was cheap and easy to make – ideal. I rediscovered it this year and now make it to have with drinks. It freezes well so I just put out what I need and keep the rest for later. If you don’t want to do that you can easily halve the recipe. This is an old recipe of Mum’s that I’ve been making for years. I originally made it as a spread for toast, but it’s just as good on biscuits with drinks. It used to be a pain to make as you had to put it a mincer, which was messy and took ages, but now you just throw it in the blender. You can make it as chunky or fine as you like, my sister-in-law loves it and I try to remember to make it when she’s coming to stay. Our family had a great picnic in the park last Sunday and my lovely 7 year old granddaughter and I made a Savoury Luncheon Slice* to share. On the same page as that recipe is this other slice of Mum’s which is also an old family favourite. The two us will have to make it for the next picnic. A couple of years ago my youngest son had a great holiday in Tasmania and came back with several bottles of a new cider he’d discovered – Pagan Cider. 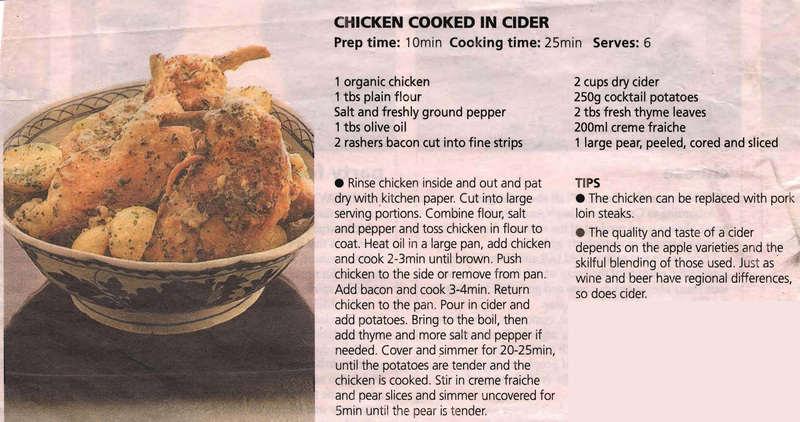 Since then we always have a few bottles in the fridge, one of which I’m now going to use to try this chicken recipe – guess I’d better make it when he’s coming for dinner. 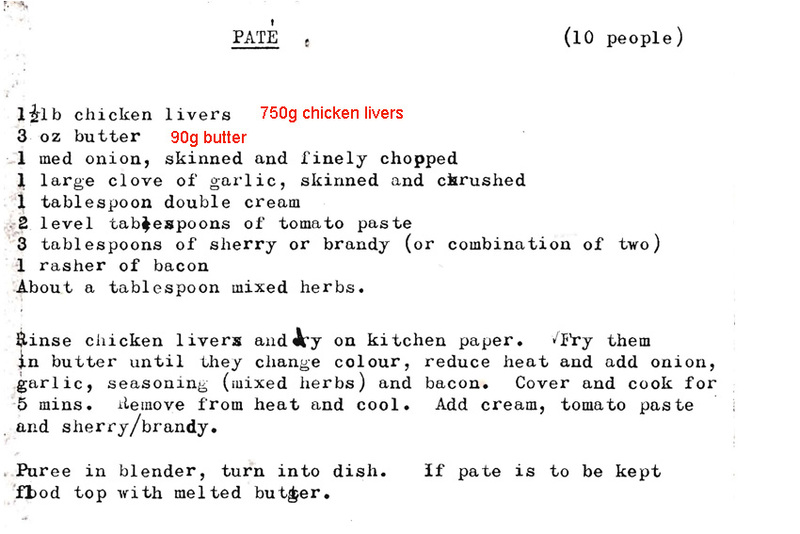 I found this recipe the other day in Mum’s collection and thought the name was, frankly, weird – Indonesian Spaghetti. When you read the actual recipe though, I think it might taste OK, haven’t worked up the courage yet to try it though……………….. This recipe serves 2, but it would be easy enough to double it and serve it as an entree at a dinner party, especially as you could prepare it beforehand and then cook it at the last minute. 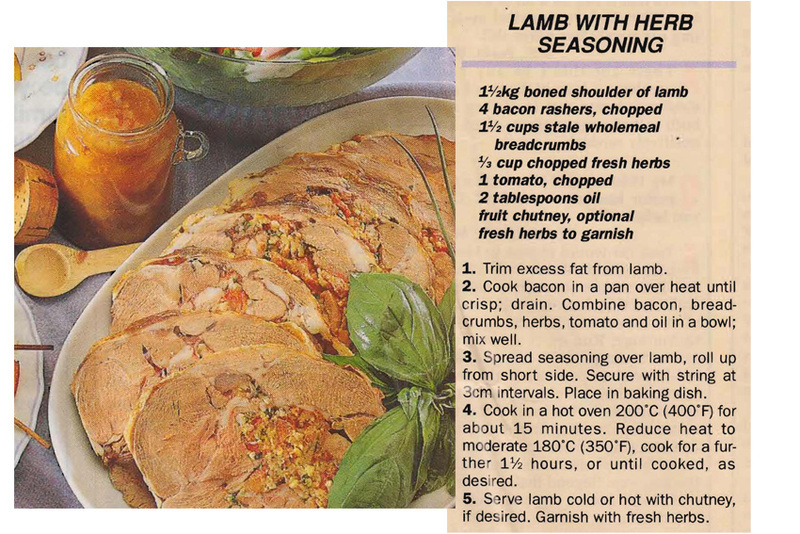 Back when this recipe was published if you didn’t want the hassle of boning the shoulder of lamb yourself you’d have had to ask your butcher to do it for you. Now supermarkets sell them already done – that’s real progress for you…….